On Sunday, January 17, 2016, I went to Ritch Grissom Memorial Wetlands in Viera, FL, for a walk around the ponds. There are always hundreds of birds at the Wetlands so I brought my camera just in case I saw something interesting. It wasn’t a great birding day, but I did take a few photos. 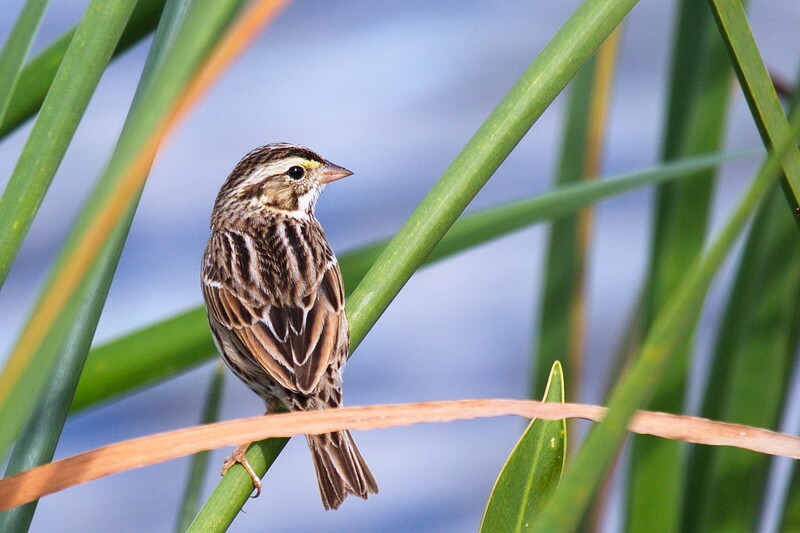 While I was walking I saw a small bird fly past and land among the reeds. 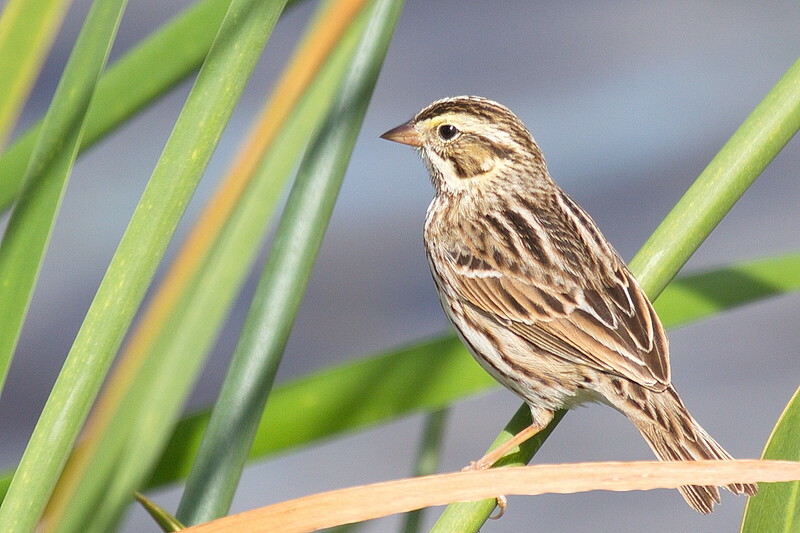 I didn’t know what it was, but a photo or two yielded a Savannah Sparrow. Here is a second view of this bird as it looks in the opposite direction from the previous photo. 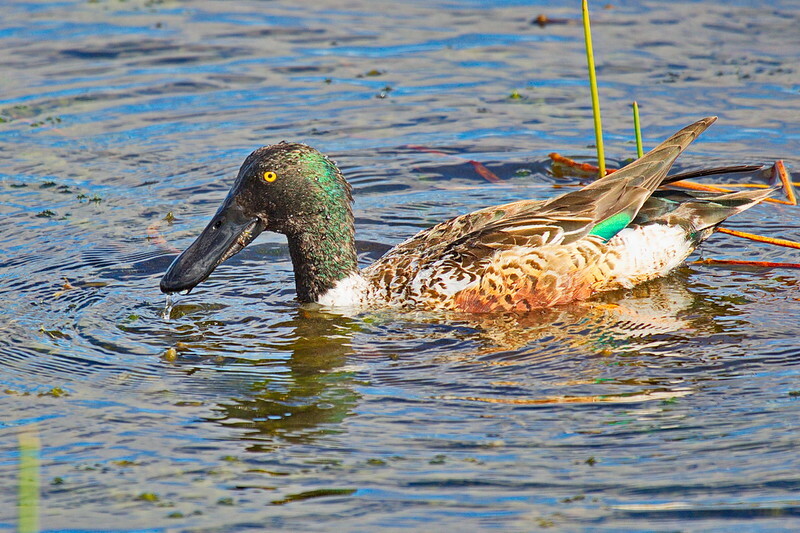 The Northern Shoveler is easily identified by its large bill. 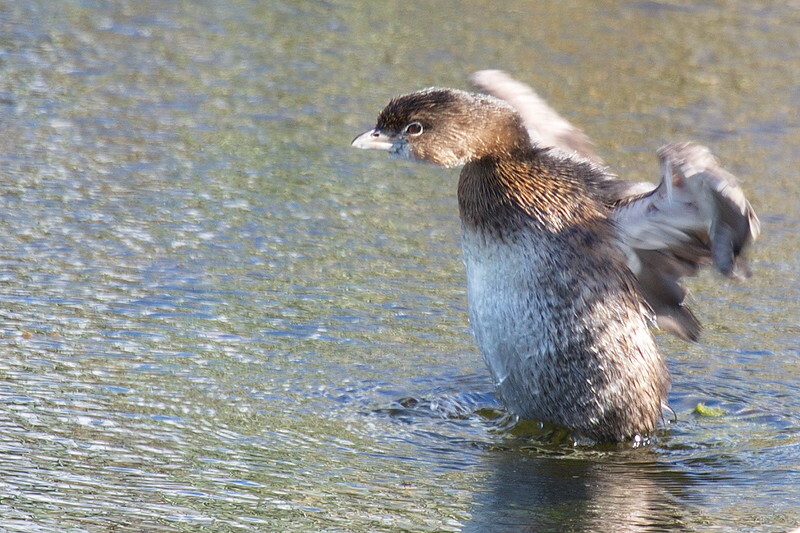 This bird just brought its head out of the water after looking for food; water droplets drip from its bill and still cling to its head feathers. 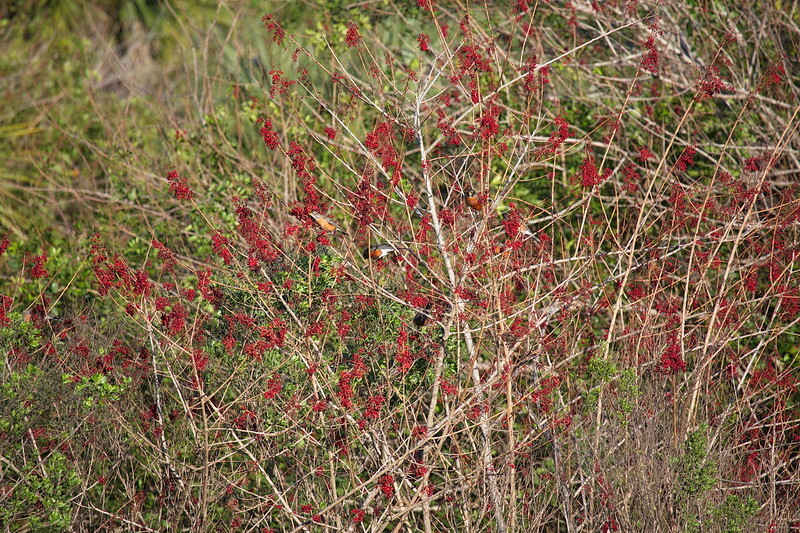 Examine this bird carefully; it has spots of many different colors. Grebes dive for their food, and when they do they submerge completely for a while, surfacing feet from the place where they dove. This one was a bit waterlogged, so almost climbed onto the surface of the water as it rapidly shook its wings to dry them. Just before I completed my walk I saw a flock of about fifty birds fly overhead. They had what looked like bright red breasts with white bellies. When I took a second look they were gone. But a third look found them flying into a distant grove of trees with ripe red berries. 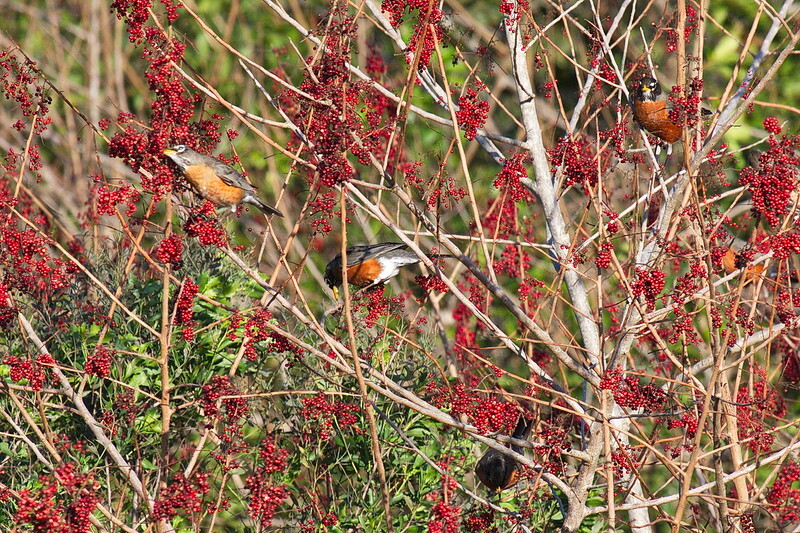 It took my 400mm (8x) lens to capture this general photo and to identify the birds as American Robins. 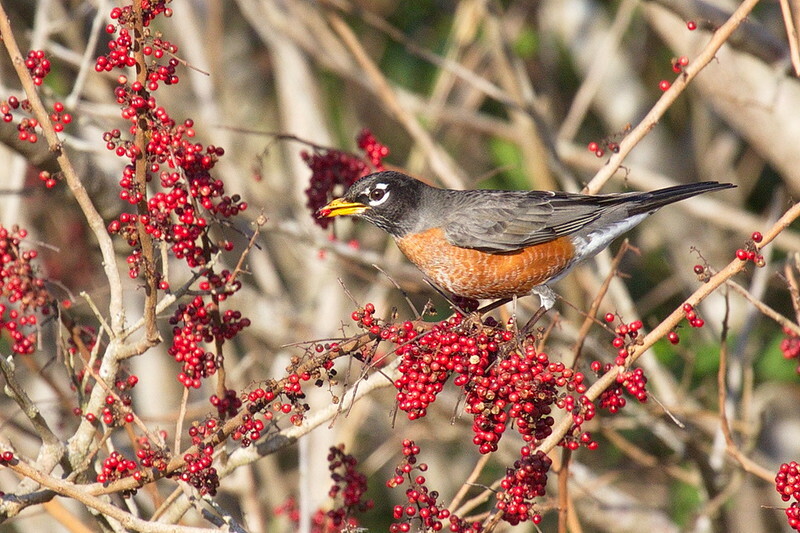 I guess I’ve become Floridized in the 21 years I’ve been down here in FL from NY because Robins are a dime a dozen in NY and during my NY days I would never have had any trouble identifying them. I cropped the above photo to focus on just a few birds. I count five Robins in this photo, but there may actually be 5-1/2. Further cropping yields this hungry specimen. 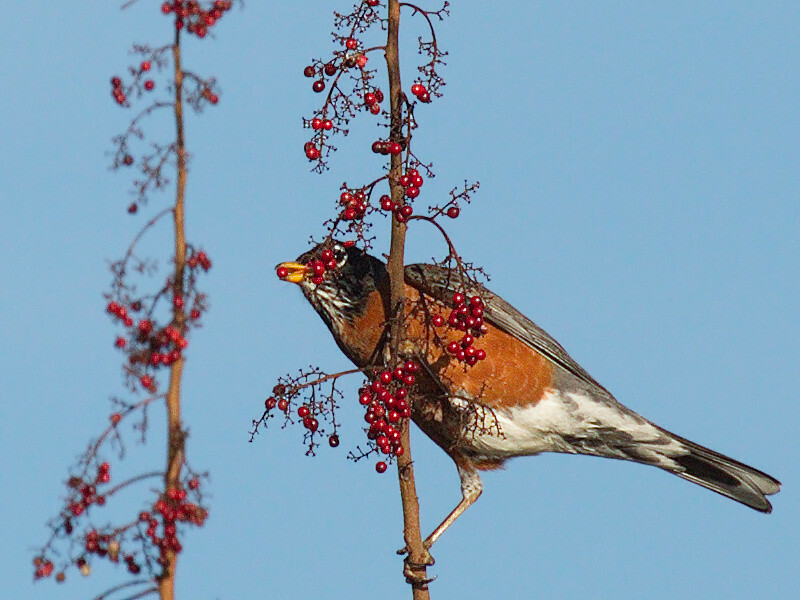 One Robin found his delights at the top of the trees. 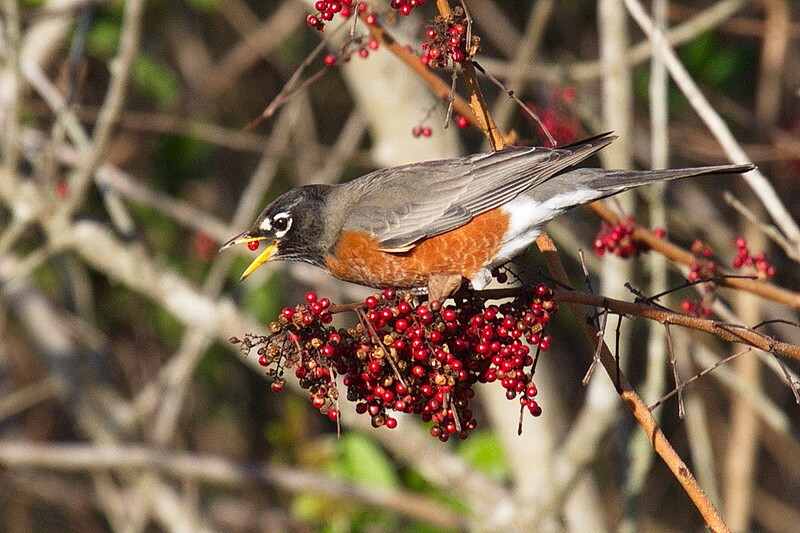 I saved this Robin for last as it is my favorite Robin photo from that day. I thank Canon for my 5D Mark III and my 100-400mm zoom lens, without which I would never have been able to pull these individual birds out of the tree full of them as seen in American Robins 1 above. Bravo, Canon! This dude (or dudette) was in the reeds with wings spread for drying in the sun. I was on the “wrong” (shady) side of him, and since I’ve taken Anhinga photos in the past, I ignored him. 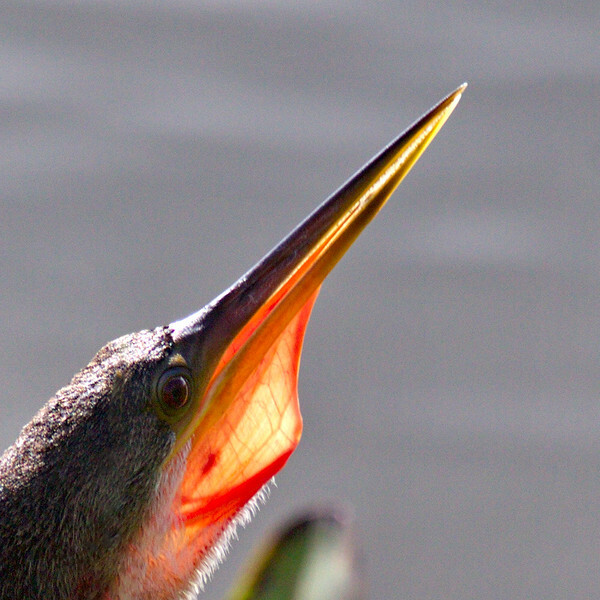 But when he expanded his yellow-orange throat pouch I took notice. The back-lit pouch presented a photographic opportunity I couldn’t ignore. Snap!